Using a Korean hand hoe to unearth the maple root flare. Sometimes being in Extension is a double-edged sword: you know enough to get yourself in deep. In my case, under the deck digging 12 inches below the soil surface for six hours. 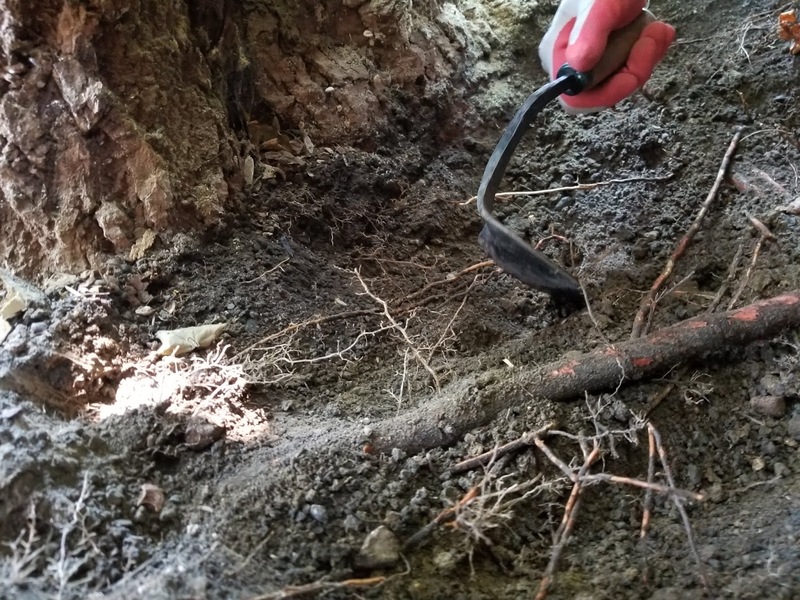 Expanding an opening in our deck to accommodate the girth of our prized native sugar maple was an opportune time to take a look at the root flare – except I couldn’t see it. I knew from my work in Extension that burying trees too deeply can create the perfect environment for circling and stem girdling roots to form and compromise tree health and longevity. I am hoping you can advise on a sugar maple (mine). Our deck was built around the tree in 1986. The tree was here first - we came in 1992. 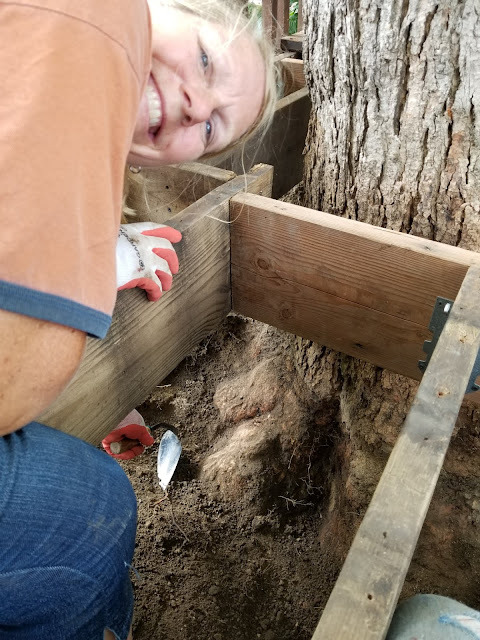 We are enlarging the tree hole in the deck. Overall, it's a pretty healthy tree with a little storm damage at the top, and woodpecker visits on occasion. We had it pruned a couple years ago. We often say this tree is the most valuable thing we own. Being under the deck, the roots seem to be shaded/cool, the clay soil does not seem too compacted, and there is no plant competition. A rain barrel overflow pipe also drains near the tree under the deck. First, I'll refer to the research we did on sugar maples in the 1990's where burying the trunks/main order roots by 3.5 inches or more statistically correlated to a decline in health/condition as well as the frequency of SGR (stem girdling root) formation. So my first recommendation is to unbury the stem/roots as much as possible without harming the tree. The root flare emerges - 12" below the soil surface! I gathered my tools and got to work. Six hours later, I had unearthed the massive root flare, removed stem circling roots and spread the excess soil under the deck away from the tree. The root flare looked fantastic and healthy. What a relief! I wrote to Gary the next day to fill him in. Thanks for your advice. Just want to share that I was able to dig out the root flare of my maple tree. It was long, hardwork, but totally worth it when that big ol' flare appeared. It was buried about 12 inches in hard-packed clay. 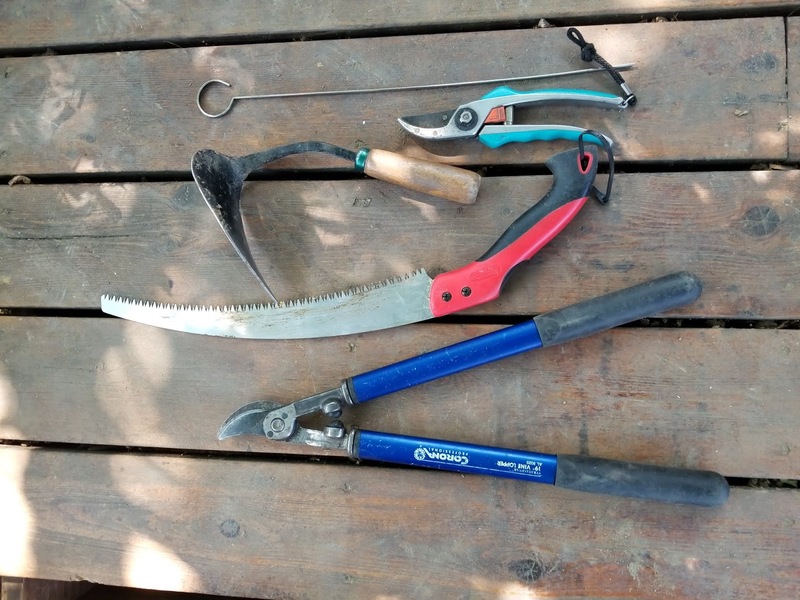 Being under the deck meant navigating stringers and narrow spaces, so I used a Korean hand hoe most of the time. I felt like an archeologist!